I have been enjoying a two week stretch at home with my feet on the ground. This has allowed me to indulge in some much deserved time at my sewing machine. 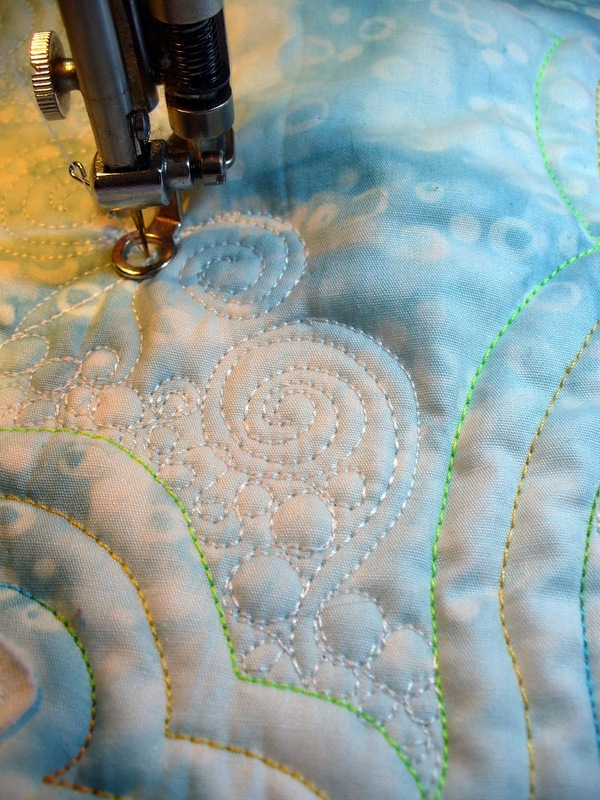 Usually my quilts are very detailed and intense without a lot of room for free-style fun stuff. Chloe and Samantha's school holds a yearly fund raising auction that's quite a big deal. 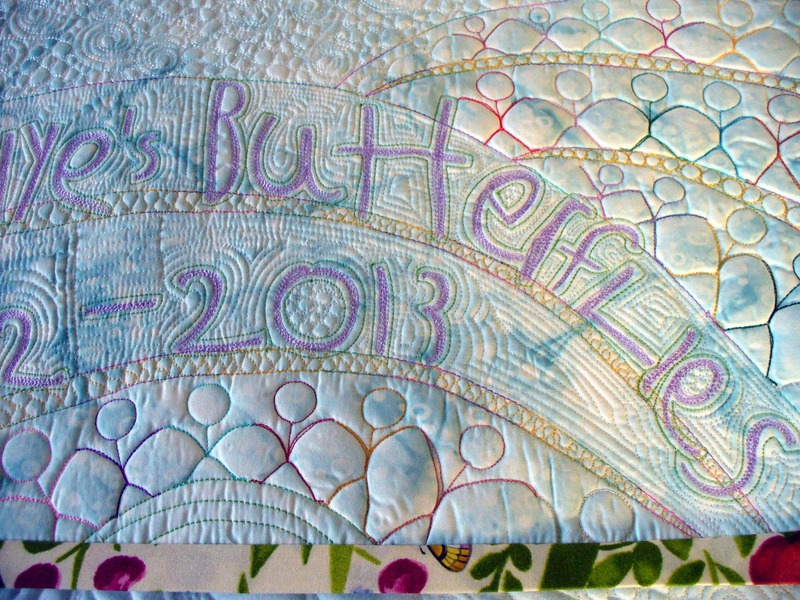 My favorite oldest daughter, Jenny (their mommy), came up with the idea to make a quilt for fund raising...hmmmm...wonder how in the world she ever came up with such an idea??? :) Samantha is in Miss Nye's kindergarten class and they are known as "Miss Nye's Butterflies". 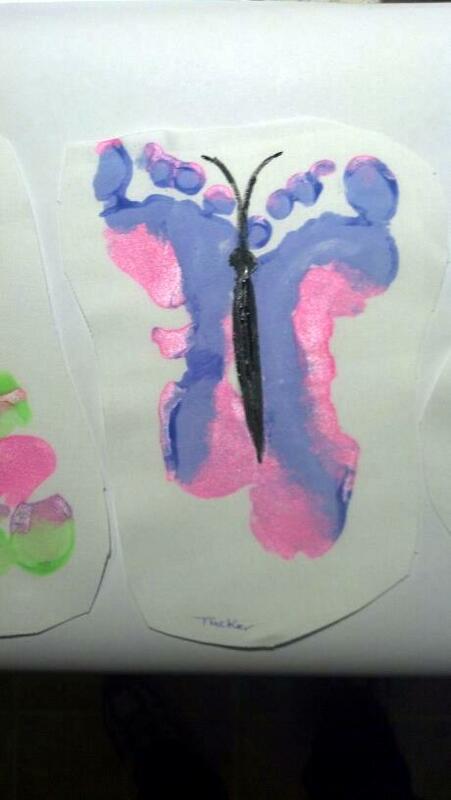 Jenny painted each child's bare feet and had them stand on a square of stabilized white Kona Cotton. 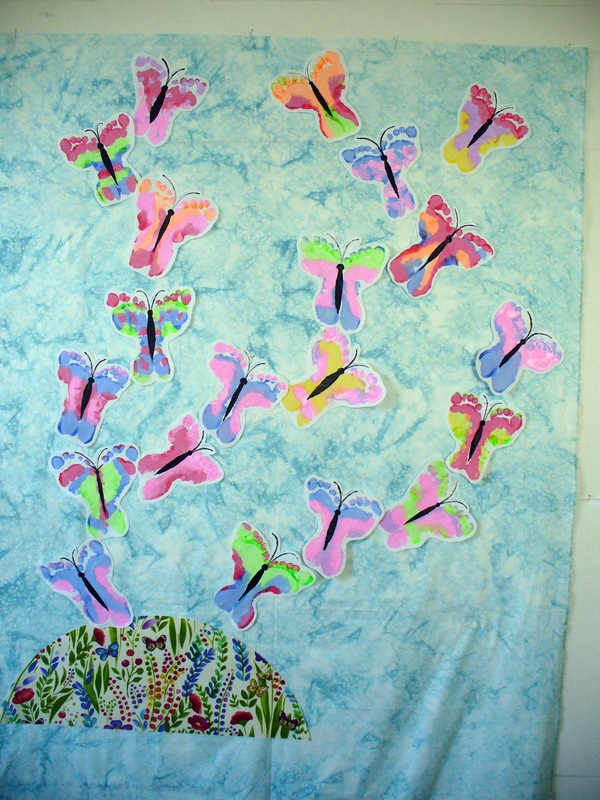 Once dry, each pair of feet were turned into butterflies...very cool! 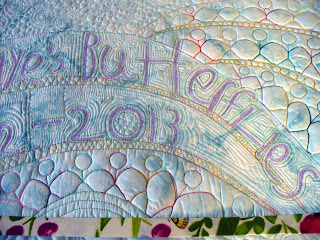 We placed the butterflies on a beautiful blue/white Batik, added a small hill at the bottom for interest, and pin and straight basted. I quilted around the outline of each foot to hold it down but had raggedy raw edges of fabric and decided to scribble around all the raw edges which worked and softened up those cut edges. 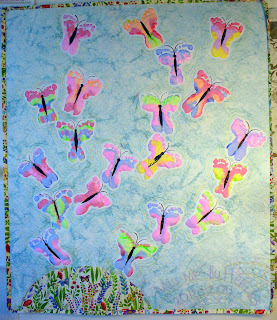 Each butterfly was echo'd three times. 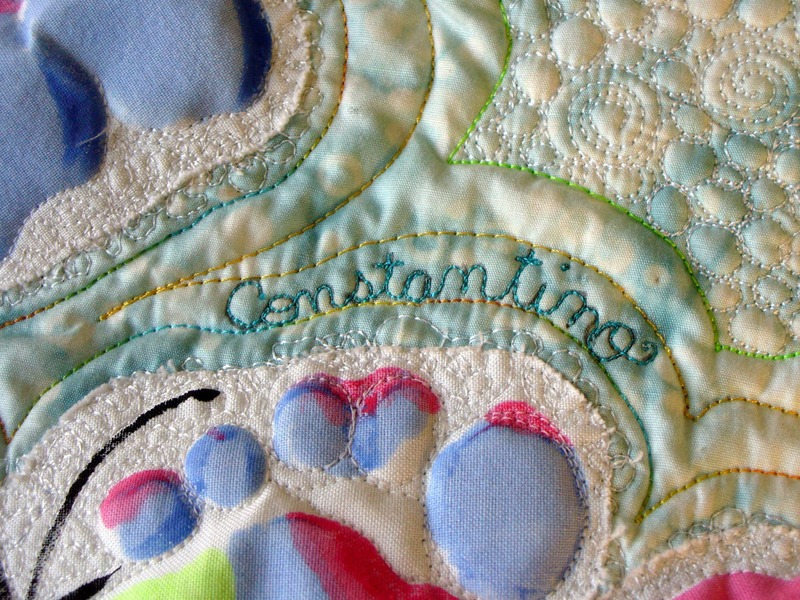 Each child's name was written in the echo and then quilted down. I had a massive amount of background to fill and did so with large bubbles and swirls. 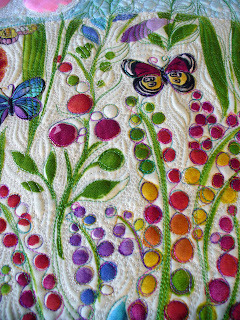 I think I can do them in my sleep I've done soooo many hours of these but the end result is fabulous! I spent ALL day yesterday working on the bottom of the quilt. 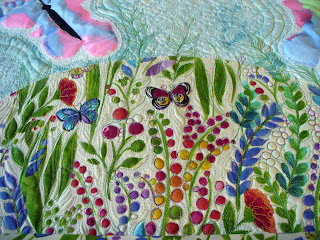 Something had to be done with the nobby hill of flowers and I had a blast doing the thread play and working the flowers and leaves into the quilt to soften it up. 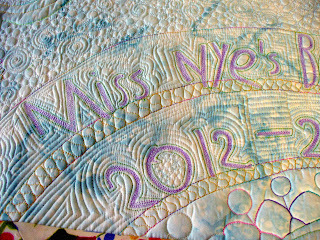 I also had Samantha write out "Miss Nye's Butterflies 2012-2013" for me and I traced this into the bottom of the quilt into a second "hill" and spent hours quilting all the letters. 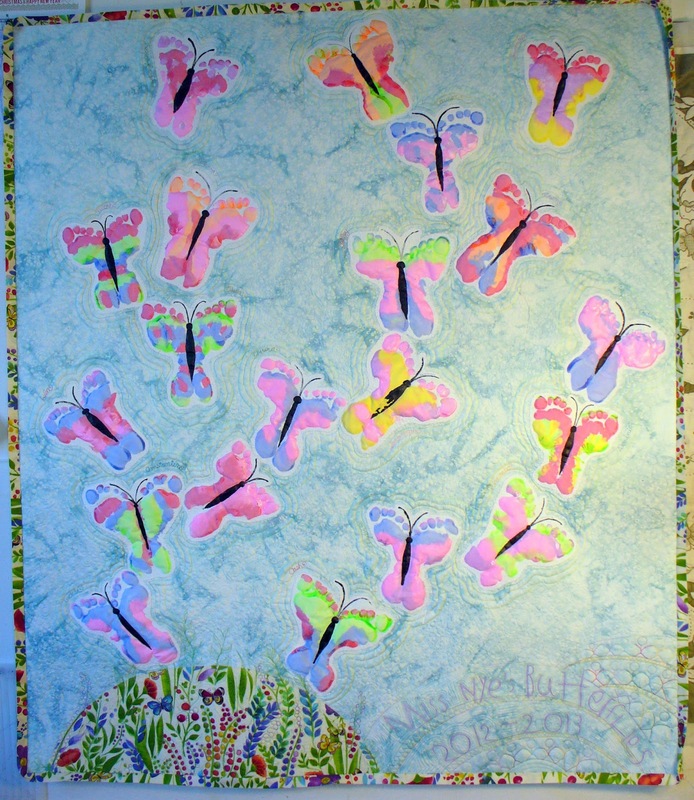 The bottom still looked a bit awkward so I added a third "hill" and I added 20 "stick children" all holding hands...each is in a different color thread. Very happy with how this part turned out. 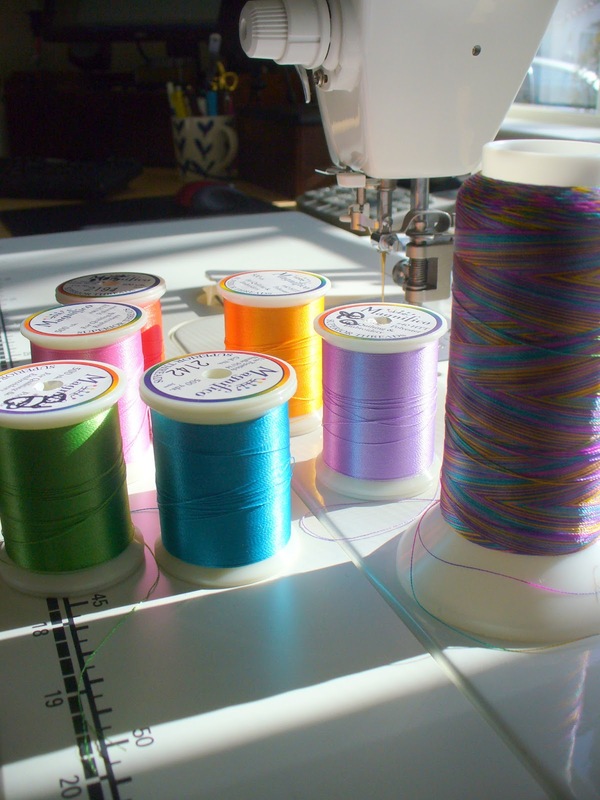 I really need to give a high five to Superior Threads. They have just come out with a new line of thread called Magnifico. 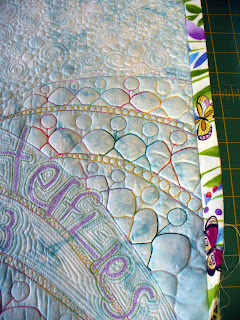 While I was at Road to California Bob loaded me up with lots of beautiful colors for my Open Thread Bar workshop and I dove into these for this quilt. I hadn't used it before and felt it would give me the perfect opportunity to become familiar with it for teaching. WOW. 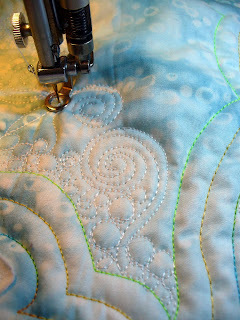 I quilted with these threads for a full week and the thread never shredded, broke, misbehaved or became cranky. 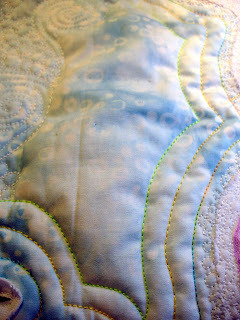 My quilting stitches are all full and the colors sharp and vibrant. This isn't an "advertisement"...just a compliment and passing good information forward. Soooo, I thought you would enjoy my journey of working on a silly and fun quilt for a very good cause. It was a great time working with Samantha, Chloe and Jenny...we make a great team! I recently started my own Pinterest boards so for those of you who are Pinterest fans, I have a board with pictures of my family and these wonderful granddaughters I talk about. 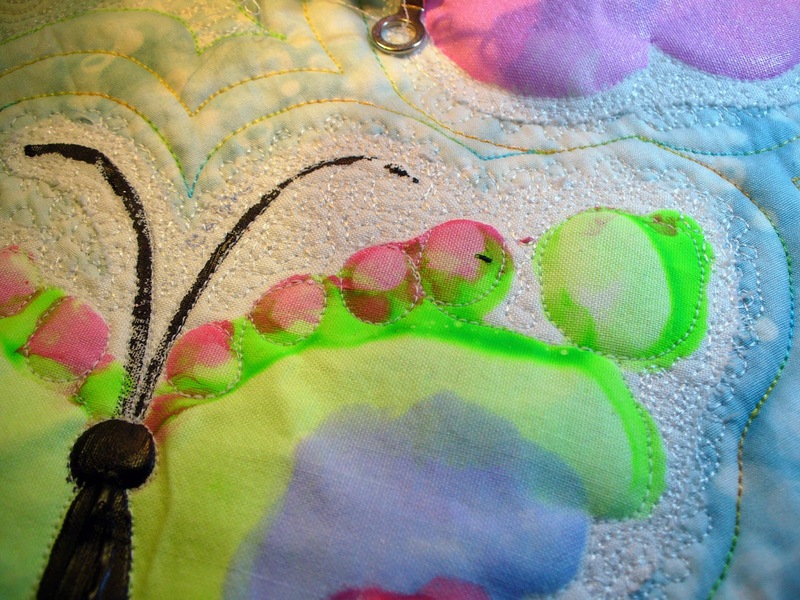 My boards also include lots of detailed shots of my linen wholecloth quilts that never make it to my website. OH. MY. GOSH. ! ! ! This is super stinkin' fantastic! From the painted footprints to the scribbling over the raw edges, the gorgeous fill, the very cool extensions from the flowers, and the little stick kids holding hands. I am floored. Somebody is going to make out winning this at the auction! And yet, even as you "play" you create a masterpiece. What an awesome grandma! Thanks for sharing! Wow - what a fun and happy quilt. Love the look of the Magnifico. And I can just see every child wanting mom and dad to bid on it! This is fabulous, so clever, beautiful and meaningful. 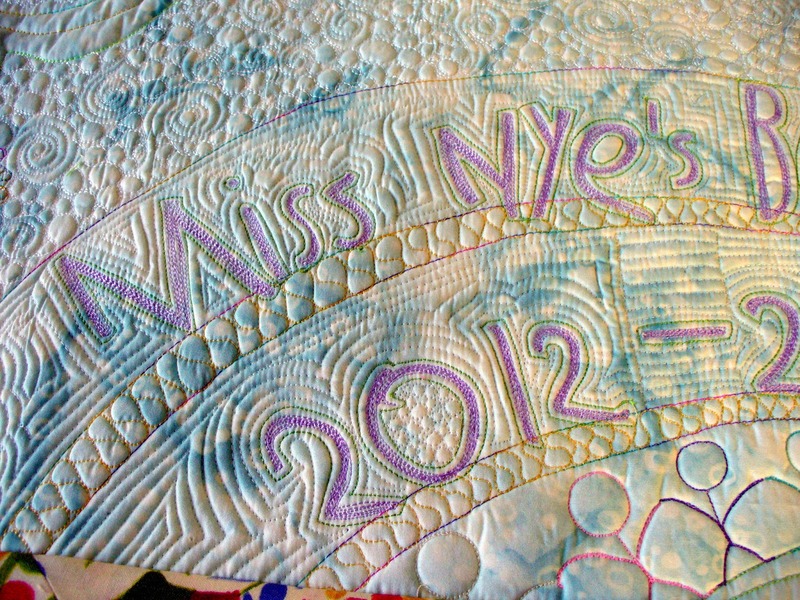 I love it, and what a special quilt all the way around. Awesome! 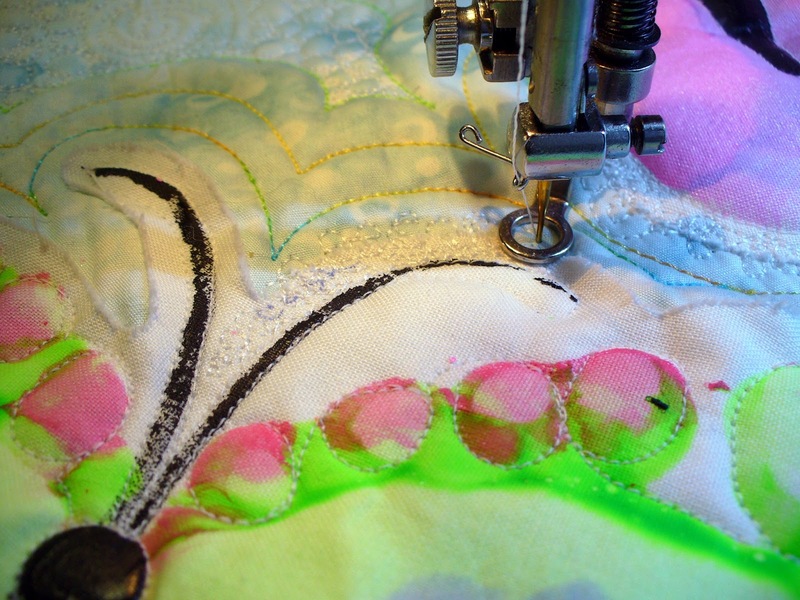 Your work is an inspiration. Thank you for sharing it through your blog. 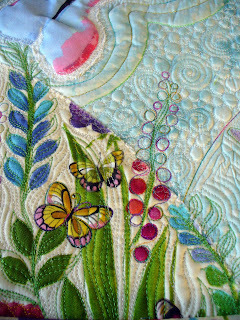 I hope to meet you in Sisters in July at the Quilter's Affair. 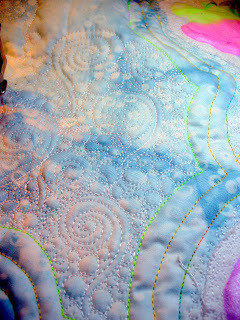 This is the cutest, most beautiful quilt ever!! What a creative, artistic family! Awesome! Una colcha muy bonita y divertida. Awesome! I've done the hands that were made into fish for one of my customers but had never seen feet into butterflies! 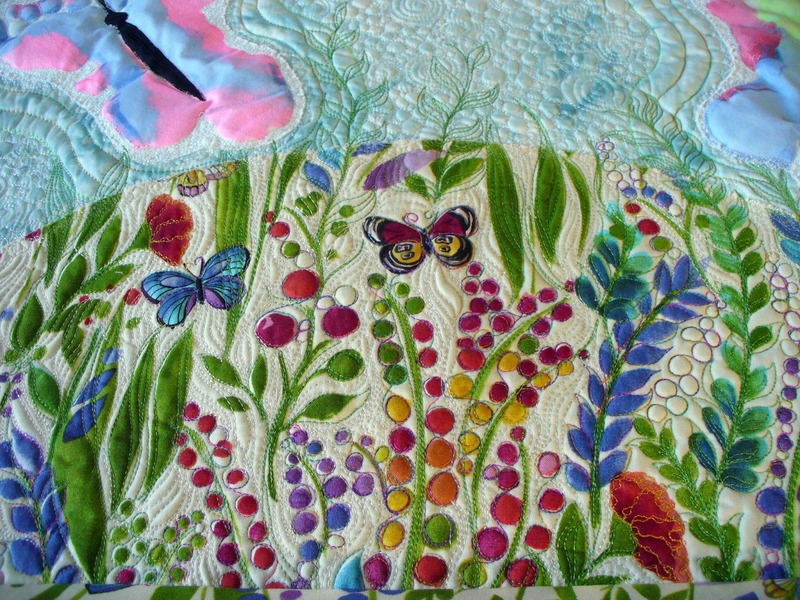 How wonderfully creative!